We were 14 strong on this cold frost morning! Jack was the lucky winner in the table stakes and Glenn tried to find the elusive Ace of Spades. No luck! Our annual Christmas Party will be Sunday December 16 at 5:30pm in our Regular Meeting room. Attendees are encouraged to bring a wrapped gift from their ‘Re-gift’ collection, which then will be jealously fought over during the evening. This will be a catered meal and more info will follow ASAP. Cathy Goheen has sent a message that she is collecting all kinds of glasses to take on her next trip to Nepal. She leaves mid December and all donations, including reading cheaters, can be dropped off at Dr. Spec Optics in Orchard Plaza Shopping Mall. November is Foundation Month! Quite a number of donations were collected at the Rotary Dinner on October 24, but monies are still be collected by Margaret throughout November. The Gates Foundation will multiply our donations by 3! What an incentive! Assistant District Governor Jim Hawkins is coming to our club next week to talk about the Foundation. Your cheque will be warmly accepted! Brenda has sent a detailed email to all Rotarians about signing in to Club Runner and updating personal information. Rotary International is a little concerned about the number of members we have who were born in 1900. Please update your information. 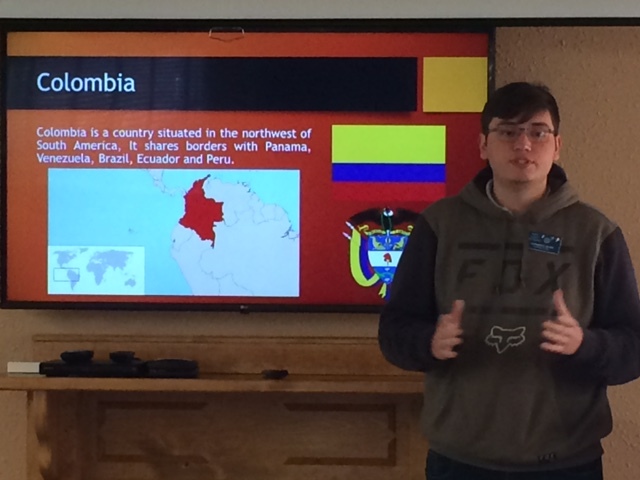 Hernando, aka Nando, gave us a very interesting presentation of his homeland, Colombia. He started with the presentation of his national anthem, but thankfully did not play the entire piece, which runs 17 minutes in length. Nando explained the education system he has been a part of for 14 years – from the age of 3 until graduation at 17 in the same building. Colombia is very rich in culture and nature, and Nando will give us Part 2 as there is so much to cover. Here is an opportunity of a lifetime to each and every Rotarian! Please consider including Nando in your entertainment/family/social/dining plans. He is anxiously awaiting experiencing hockey games, family dinners, Canadian holidays and customs, his first snow, skiing/boarding, skating (think outdoor arena in Kelowna), movies, travel. If you have trouble contacting him, please get in touch with Brenda. Remembrance Day: The official Remembrance Day ceremony in Lake Country will take place at 10:30 a.m., at George Elliot High School. We are hoping for a good turn-out of Rotarians for this event. Margaret Brown will be presenting a Remembrance Day wreath, on behalf of our Rotary Club. The Lake Country Calendar will be hosting the next LC Chamber of Commerce – Business After Hours social on Wednesday November 14, at 5:30 p.m., at the Winfield Curling Club. Delicious appetizers, wine and great networking opportunities, all for a $5 admission fee.